Bad Luck or Bad Business? In 13 Most Common Tax Mistakes Made by Business Owners, certified tax coach William G. Cummings, CPA, draws on his more than twenty-five years of experience helping businesses lower their obligation to the IRS. His helpful, easy-to-understand advice stresses tax planning long before tax prep, and it covers pitfalls such as selecting the wrong business entity or retirement plan and missing the many allowed deductions available to business owners. Cummings also helps readers get over their fear of being audited through data showing audits at a historic low and with strategies on how to audit-proof tax returns. Rather than a how-to guide, this book spurs business owners to hire the right financial guide so they can get back to business and let the tax experts focus on achieving the highest tax savings available to the company. 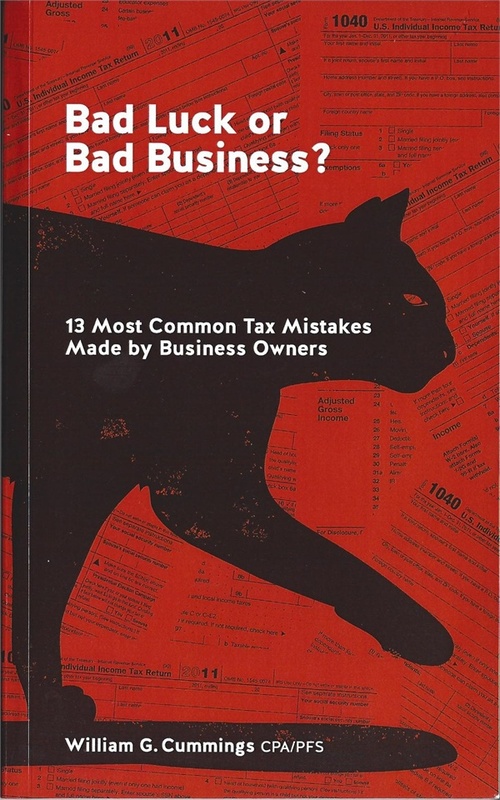 When paired with the services of a tax planner such as Cummings, 13 Most Common Tax Mistakes Made by Business Owners helps businesses use every legal deduction and loophole possible. Fans of Dominique Molina's Secrets of a Tax Free Life will want to put this book on the shelf right next to it for reference throughout the year. Click Here to Buy Bad Luck or Bad Business? Why didn't my CPA tell me THAT? Bill was a contributing author for this valuable tax book? Are You Getting the Smartest Tax Advice? Understanding the difference between tax prep & tax planning could save you thousands! America's Top Certified Tax Coaches share dozens of write-offs you've never heard about. Taxes continue to be the single biggest expense for business owners and entrepreneurs. What most business owners don't realize is there are dozens of ways to save on taxes that most conventional CPAs have never even heard about. Learn the secrets your tax advisor may not even know: Profiting From Obamacare: Capturing "Use-It-or-Lose-It" Tax Credits When "Tax-Free" Isn't: Simple Mistakes that Blow Your Tax-Free Status When Is a Profit Not a Profit? Tax Checklist for Your Financial Advisor You'll also find helpful checklists and action items to start slashing your tax bill as early as next month! 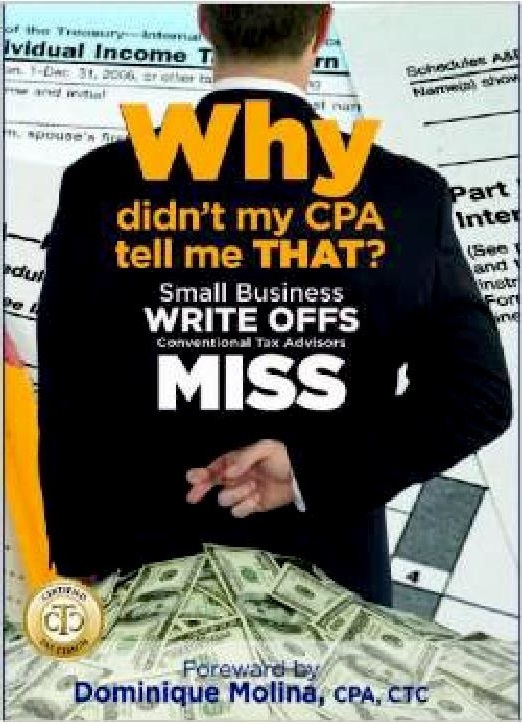 Click Here to Buy Why didn't my CPA tell me THAT? It wasn't on my calendar. Most people do not plan for a medical, mental or aging crisis for a parent-or themselves, and if such a crisis is not on your calendar, prepare now. None of us know what we don't know, and when a loved one's health and/or mind are failing, this is no time to have a crash-course in learning. Who do I turn to for advice? What kind of questions do I ask? Do I plan a loved one's care for this immediate crisis-or make a plan that includes future needs as conditions worsen? How do I respond to the many needs: place to live (kinds of facilities), care (who provides and what kinds), costs (and how to pay them), and advisors (finding the right people to handle finances and elder planning). 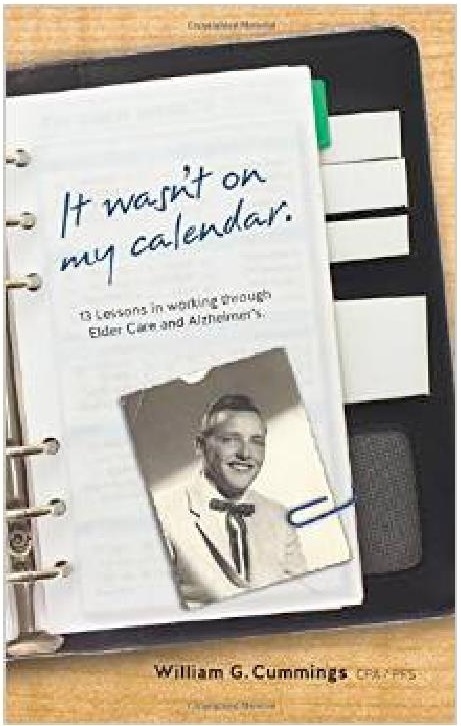 If you have more questions than answers, this first-hand guidebook, written by a CPA/ financial planner about his dad's situation, will provide answers. Now you will be able to deal with your own situation with more knowledge and focus. Click Here to Buy It wasn't on my calendar.